Post war immigrants to Britain have often arrived with little education, but in the second generation almost all significant ethnic minority groups catch up with or overtake the low and middle income White British in average educational attainment. Ethnic minorities tend to be more educationally aspirational than the White British majority and now have higher proportionate representation in degree-level education, including in elite Russell Group universities. 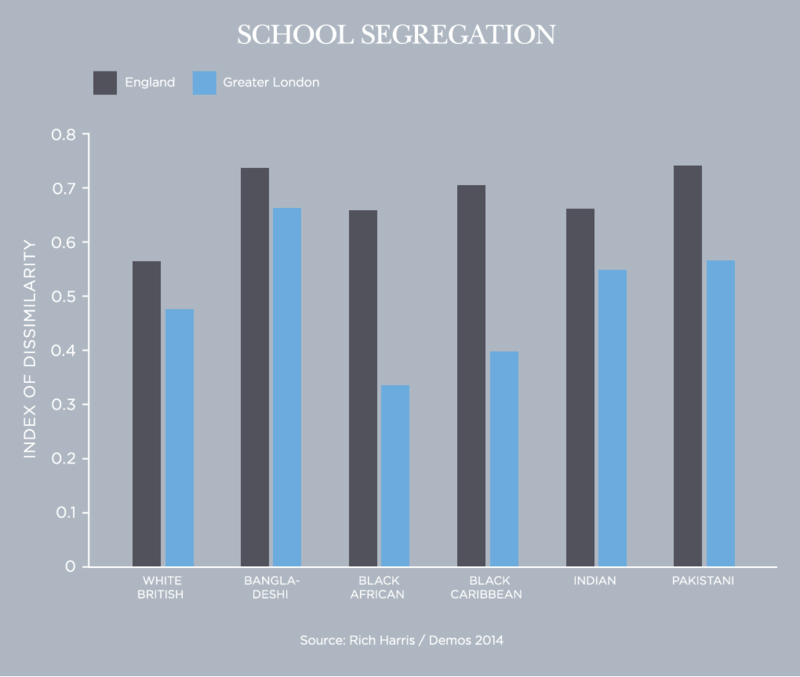 But meanwhile British schools have become quite highly segregated. Roughly one third of state primary school pupils in England are from ethnic minorities (including white minorities). More than half of ethnic minority pupils in England are in schools where the White British are a minority, rising to 60 per cent for those in Year 1. After adjusting for class the White British perform worst of all major ethnic groups at GCSE and White British and Black Caribbean pupils do the least homework. Among those with A levels, a slightly higher proportion of ethnic minority students than White British study at the elite Russell Group colleges (the White British proportion at 10 per cent is the same as the Bangladeshi proportion). But white students are more likely to get first class degrees and less likely to be unemployed after graduating. Nearly 30 per cent of private school students are from ethnic minority backgrounds and ethnic minority parents are more likely than white parents to pay for extra tuition. The White British ethnic majority are overtaken by most of the generally more educationally aspirational minorities as early as Key Stage 2 (age 7 to 11) with Chinese and Indian pupils performing especially strongly. The White British lag all groups in GCSE results except for Black Caribbeans and White Others. The 1 million pupils who speak English as an additional language have narrowed the gap with native English speakers and in inner London even outperform them. Less than half of the White British stay on for A levels—figures are much higher for most minorities—but those that do are more likely to get top grades than minority pupils, with the exception of Chinese and Indians. Before schooling has begun White British children perform better on average on vocabulary than all other groups, except the Chinese (see Dustmann et al). Thereafter the story is largely one of the White British average being reached and then surpassed by most ethnic minority children though with big variations between groups. In the case of pre-school children’s ability to identify pictures and patterns it is only in the cases of Pakistanis and Bangladeshis that there exists significantly lower performance relative to the White British. In 2015/16, the proportion of white British children reaching the expected standards in teacher assessments at Key Stage 1 (around age 7, after two years of schooling) was as follows: 92 per cent for phonics, 75 per cent in reading, 66 per cent in writing, 73 per cent in mathematics and 84 per cent in science. The proportion for ethnic minorities tended to be marginally lower however Indian and Chinese children consistently outperformed their white British counterparts. The ethnic minority group that had the lowest level of reading skills was the White Other category with 67 per cent meeting the required level. School children’s performance at Key Stage 1 has been incrementally improving with the biggest improvements between 2010 and 2014 being found among Bangladeshi, Black Caribbean, and Black African children (all groups are heavily represented in London and may be benefiting from the significant improvement in school outcomes in the capital). Across ethnic groups, girls outperform boys at Key Stage 1. However, there is variation in the extent of the gender attainment gap. The attainment gap is most pronounced in teachers’ assessments of their pupils’ writing ability. For White British, the general attainment gap between boys and girls is 9 percentage points. The gap is greatest for Black Caribbean children (12 percentage points) and smallest for Indian children (5 percentage points). The greatest divide in educational attainment is that between those on free school meals and those who are not. The attainment gap is much greater for White British, White Other, and mixed ethnicity groups than for all other ethnic groups. For instance, in writing assessments, it stands at 17 percentage points compared to 6 percentage points for Indians and 7 percentage points for Black Caribbeans. At Key Stage 2, ages 7 to 11, 54 per cent of White British children met the desired level in reading, writing, and mathematics in 2014. They were out-performed by Chinese and Indian children – 71 per cent and 65 per cent respectively. Bangladeshi children performed slightly better with 56 per cent meeting the desired level while Pakistani children performed worse – 47 per cent met the desired grade. For Black Caribbeans 43 per cent reached the expected level as did 54 per cent of Black Africans. All ethnic groups have been improving their performance in GCSEs: in 2008/9 the proportion of White British children achieving 5 or more GCSEs at A* to C level (including English and Maths) was 50.9 while in 2012/13 it was 60.5. The White British are out-performed by two ethnic groups in particular – the Indians and the Chinese. In 2008/9, 67 per cent of Indians achieved 5 or more GCSEs at A* to C level (including English and Maths) while in 2012/13 the same proportion had risen to 75.7 per cent. The Chinese over the same period had seen a rise from 71.6 per cent to 78.1 per cent. Bangladeshis and Pakistanis have historically lagged behind the White British but have recently made strong improvements – notably the Bangladeshis have now overtaken the White British with 64 per cent getting 5 or more good GCSEs (probably boosted by the London effect). Mixed ethnic people and Black Africans are roughly on a par with the White British while White Others and Black Caribbeans still lag behind despite some improvements in their grades. However, research by Wilson, Burgess, and Briggs have shown that once class is taken account of (i.e. accounting for the fact that a higher proportion of white people are middle class), progress for white children throughout secondary school is the lowest of all the major ethnic groups. In 2013/14, there were roughly 1 million children speaking English as an additional language accounting for almost one in six of pupils. This proportion has more than doubled since 1997. The number of primary school pupils in England who had a first language other than English was 18.7 per cent (654,000) in 2014. For secondary schools this was 14.3 per cent (455,000) of pupils. Half of schools have fewer than 5 per cent of pupils speaking English as an additional language while 8.4 per cent have more than half of their students speaking English as a second language. The highest concentration of pupils without English as a first language is found in Free Schools. Those who have English as a first language out-perform those without although the gap in obtaining 5 or more good GCSEs is relatively small and has held constant in recent years at around 2-3 percentage points. Research has shown that pupils with English as their first language who are in classes with many others who do not have English as their first language perform no worse than those in classrooms where everyone speaks English. Performance at GCSE level was poor among speakers of Portuguese, Somali, Lingala, and Lithuanian while Russian and Spanish native speakers did well. The attainment gap between those with English as their first language and those who speak it as an additional language in achieving 5 or more good GCSEs varies greatly across regions. It is greatest in Yorkshire & The Humber at 10 percentage points and least in Greater London at -0.4 percentage points. In Inner London, non-first language English speakers actually marginally outperform first language speakers with the differences most notable in Tower Hamlets along with the boroughs of Islington and Kensington and Chelsea. Generally, girls out-perform boys at GCSE-level when it comes to getting 5 or more good GCSEs and this is true for all the major ethnic groups. The performance gap between boys and girls is greatest for Black Caribbeans and smallest for the Chinese. A far greater division in GCSE attainment is between those on free-school meals and those who are not. For White British children in 2012/13, 32.7 per cent of those on free school meals got 5 or more good GCSEs compared to 64.5 per cent of those who were not – a gap of 32.2 percentage points. For ethnic minority groups the attainment gap is much lower – for instance, for Bangladeshis it stands at 7.8 percentage points while for Black Caribbeans it is 14.8 percentage points. There are some important differences in GCSE subject choice. All students are required to take English, mathematics and science. However the students can study science either as a single or double award or study physics, chemistry, and biology individually. Chinese and Indian students have a preference for studying the sciences individually. Black students are less likely to study the sciences individually and are more likely to do single science than most other ethnic groups although most do take double science. There is not much difference in the uptake of English literature although Indian and Chinese students do show slightly higher rates. On completion of Key Stage 4, ages 14 to 16, most children will go onto undertake some form of further education, either academically or through vocational training. Rates of continuing education were highest among Indians and Chinese at 96 and 97 per cent respectively. For the White British it was 87 per cent and a bit higher for all other ethnic groups. Indians and Chinese young people are more likely to go on to a sixth form while those least likely to are White British and Black Caribbean. The converse relationship is observed when it comes to going on to a further education college – White British and Black Caribbeans go more, Indians and Chinese go less. White British school leavers are the most likely to take on an apprenticeship with 6 per cent doing so—take up among ethnic minority groups is low but growing (see below). A markedly higher proportion of ethnic minority students stay in education to take A levels than the White British. 47 per cent of White British school leavers in 2012/13 went on to study at a 6th form (school & college). This compares with 76 per cent of Indian school leavers and 80 per cent of Chinese. 67 per cent of Bangladeshi and 61 per cent of Pakistani school leavers went to a 6th form while for Black Africans it was 70 per cent and Black Caribbeans 51 per cent. The proportion of White British pupils getting at least 2 A-levels or equivalent was 92 per cent in 2012/13. Higher proportions were observed for the Chinese and Indians at 97 and 95.4 per cent. Lower proportions were observed for Black Caribbeans (88 per cent), Black Africans (91.3), Pakistanis (90.1 per cent), and Bangladeshis (91 per cent). Among students achieving 3 A* or A grades or better the White British perform better relative to some ethnic groups that have out-performed them at GCSE level in recent times. 10 per cent of the White British received top grades at A-level in 2012/13. This compares to 6.4 per cent and 5.5 per cent for Pakistanis and Bangladeshis respectively, while for Black Caribbeans and Black Africans the proportion getting top grades stood at 3.1 per cent and 4.4 per cent respectively. The White British are still out-performed by Indians and Chinese – the former had 13.6 per cent getting top grades while for the latter it was 23.5 per cent. They are also slightly bettered at A-level by mixed ethnicity students and White Others. 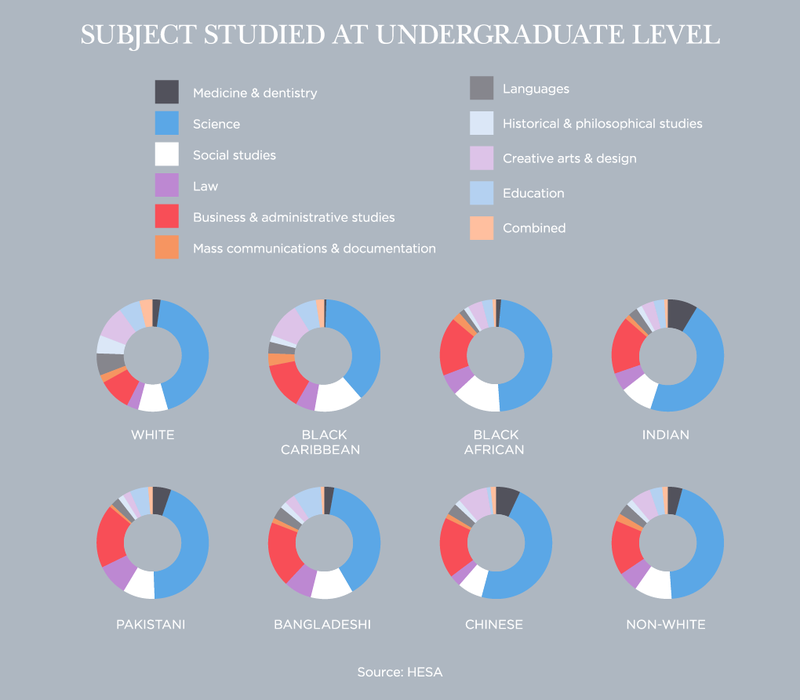 Some ethnic groups have a greater preference for certain A-level subjects. Pakistani, Indian, Chinese, Black Africans, as well as Bangladeshi pupils have a preference for science and mathematics related subjects but tend to shy away from subjects related to English or the arts. Take up among Black Caribbeans of science and mathematics related subjects is relatively low with a stronger preference for the arts relative to some other groups. For the White British the pattern of take up is similar to that of Black Caribbeans. The surprising success of London’s schools in recent years has been termed the ‘London Effect’. Urban areas often exhibit lower levels of attainment but London bucks this trend with the highest levels of attainment and progress. GCSE attainment is higher in London with only 39 per cent of pupils in Inner London and 37 per cent in Outer London NOT achieving five GCSEs at A* to C (including maths and English), compared with 42 per cent in the rest of England. This is despite London’s high proportion of children on free school meals and speaking English as a second language. Between 2007 and 2012 the proportion of Inner London 16 year-olds entitled to free school meals who failed to achieve five GCSEs between the grades of A* and C dropped from 67 per cent to 47 per cent. Outer London also saw a significant improvement for this group (55 per cent didn’t achieve those grades, down 16 percentage points from 2007). This compares to a drop of 13 percentage points in the rest of England over the same time period with 67 per cent not achieving those grades in 2012. London also stands out in terms of the progress made by pupils. London pupils have made more progress (defined as the difference between Key Stage 2 and GCSE attainment) as they passed through secondary schools and this is true for both rich and poor neighbourhoods. Indeed it is in the poorest neighbourhoods where the effect is strongest. In recent years there has been a lot of speculation as to what causes the London effect. The London Effect was first highlighted in the Financial Times in 2013. Since then, many observers including the Centre for London and CfBT Education Trust have suggested that the policies and practices adopted by London’s schools – the London Challenge – has been key. Others have stressed greater competition between schools in London and higher overall quality of teachers (and higher proportion of Teach First teachers). Another explanation is that London’s high proportion of aspirational minorities is responsible. Simon Burgess in his paper ‘Understanding the Success of London Schools’ argues that the London effect in terms of progress made is almost entirely accounted for by London’s ethnic diversity. In statistical terms, the gap between London and the rest of England disappears if we control for ethnic composition. Burgess writes that if London had the same ethnic composition as the rest of England, there would be no London effect. Success at school is not just a question of working hard in lessons but also doing homework. 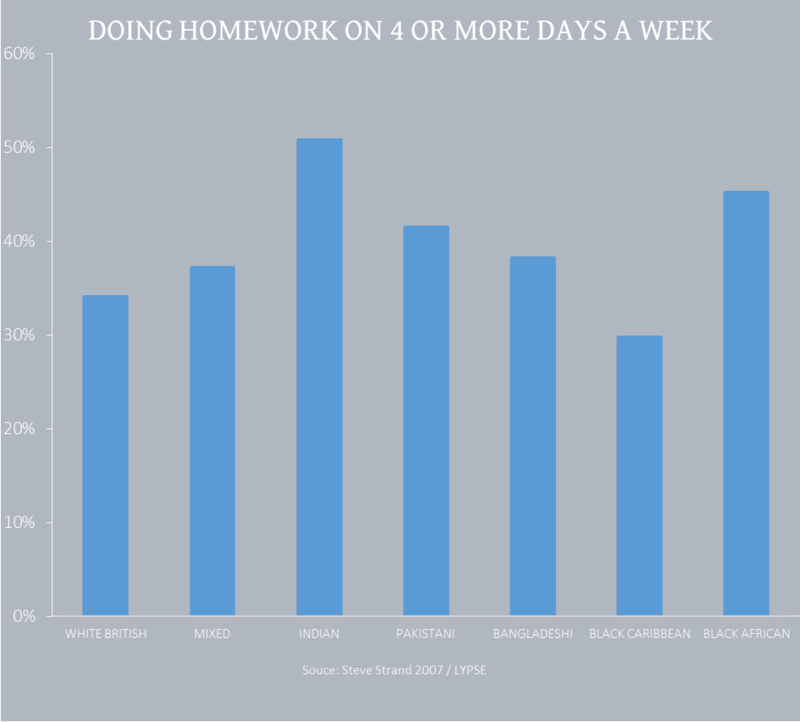 Research by Steve Strand has found that White British and Black Caribbean pupils were the least likely to report doing homework on 4 or more evenings a week – 34.1 and 29.8 per cent respectively. Black African and Indian pupils did the most homework with 45.2 per cent and 50.8 per cent respectively reporting doing homework on 4 or more nights a week. According to researchers at Newcastle University who have been studying 19,000 pupils born in 2000, children of Indian, Black and Chinese ethnic origin are more than twice as likely to receive extra-tuition outside of school than their white peers. At age 11, 48 per cent of children of ‘other’ (including Chinese) ethnic origin, 47 per cent of Black children and 42 per cent of Indian children received extra tuition compared with 20 per cent of white 11 year-olds. Religious education outside school is more common among Pakistani and Bangladeshi children. For these groups weekly attendance at a religious service or class rises between the ages of 5 and 11 from 40 per cent to 82 per cent. Regular attendance at a religious class or service rises from 52 per cent at age 5 to 65 per cent at age 11 for black children. A study by Strand and Winston looked into the educational aspirations of 12 to 14 year-olds in inner city schools. It was found that Black African, Asian Other, and Pakistani children had higher aspirations than poorer White British children who had the lowest aspirations. According to Strand and Winston the low educational aspirations of White British pupils are tied to a lack of academic self-belief and low educational values at home. Elsewhere, Strand found that those pupils with the greatest sense of their own academic worth were Indians, Pakistanis, and Bangladeshis (note that this study did not include Chinese children). Strand also found that although most children had positive attitudes towards school, those of White British, mixed ethnic, and Black Caribbean school children were the least positive. More support for schooling was found among Indian, Pakistani, and Bangladeshi children. For instance, 87 per cent of White British pupils as well as 87 per cent of Black Caribbean pupils said they were happy when at school compared with 96 per cent of Indians, 93 per cent of Pakistanis, and 94 per cent of Bangladeshis. 82 per cent of White British pupils said they worked their hardest at school as did 81 per cent of Black Caribbean pupils compared with 92 per cent of Indians, Pakistanis, and Bangladeshis (this study did not contain data on Chinese pupils). White British, mixed ethnic, and Black Caribbean school children were more likely to report not wanting to go to school, feeling school was a waste of time, and being bored during lessons. White British children were also the least likely to imagine themselves as staying in full time education after year 11 as well as going on to university. It is not just the attitudes of children that count but also those of their parents. Strand found that White British parents were less likely to want their children to stay in education after they turn 16 and more likely to want them to pursue apprenticeships or take jobs than all other ethnic groups. White British parents were also the least likely to have paid for extra tuition for their children while Indian and Black African parents were the most likely to. Furthermore, White British along with Mixed and Black Caribbean parents were more likely to report regular quarrels with their children and to admit to not knowing where their children are when they are out. Data from the Citizenship Survey shows that while most expected equal treatment in schools, Chinese people expected to be treated differently – 12 per cent expected to be treated differently (mainly better) to other ethnic groups compared to 6 per cent of white people. 6 per cent of Black Caribbeans said they did not expect equal treatment. Apprenticeships are growing in number and popularity: in 2005/6 there were 172,600 new apprenticeships rising to 434,600 in 2013/14. Ethnic minorities tend to be under-represented but in this period their share has risen from 7.5 per cent to 15.2 per cent. Much of this increase will be down to increases in the share of White Others (most likely East Europeans). According to the Black Training and Enterprise Group non-white ethnic minorities continue to be under-represented among those undertaking apprenticeships in England: non-white people make up about 15 per cent of the working age population but only 10 per cent of those starting an apprenticeship. This proportion has remained static since 2010/11. Schools, particularly primary schools, tend to be more segregated than the neighbourhoods they serve. As with neighbourhoods themselves there is more mixing among ethnic minorities themselves but less mixing between most minorities and the White British majority in schools. More than 60 per cent of Year 1 ethnic minority pupils are now in majority minority schools. In order to try to understand the trends in ethnic mixing and clustering in English schools, Simon Burgess of the University of Bristol has processed data from the National Pupil Database on behalf of the Integration Hub. You can explore how integrated or segregated England’s schools are using our specially built data map. In 2013, over 50 per cent of ethnic minority students were in schools where ethnic minorities were in the majority (although not necessarily their own minority). This compares to over 90 per cent of White British pupils who are in majority White British schools. But there is some variation between cohorts. For instance 52 per cent of ethnic minority pupils in Year 11 are in schools where ethnic minority pupils are in the majority compared to 60.8 per cent of Year 1 ethnic minority pupils. As recently as 2008 only 49.1 of ethnic majority pupils in Year 13 were in ethnic minority majority schools, by 2013 the share had risen to 54 per cent. In London alone, 90 per cent of ethnic minority Year 1s are in ethnic minority majority schools. This compares to 49 per cent of White British in majority White British schools. There are 7 local authorities where no White British Year 11s are attending schools where White British pupils are the majority. All are found in London and they are Lambeth, Southwark, Westminster, Brent, Ealing, Harrow, and Newham. By contrast, there are 71 local authorities where all White British Year 11s are in White British majority schools. These are mostly found in the South East and West as well as the North of England. Apart from the White British majority the ethnic minority groups who are most likely to be in schools where their own ethnic group is in the majority are Bangladeshis and Pakistanis—21.2 per cent of year 11 Bangladeshi students were in Bangladeshi majority schools while for Pakistanis in majority Pakistani schools, it was 19.2 per cent. The proportion of Indians in majority Indian schools stood at 9.9 per cent among year 11 pupils. For the other major ethnic minority groups, the proportion is minimal. Our analysis of the NPD reveals that for ethnic minorities at year 11, the school index of dissimilarity (a standard measure of segregation – click here for an explanation) relative to the White British was 0.57 in 2013. This means more than half of ethnic minority children would have to move schools in order for there to be a equal spread of ethnic groups relative to the White British across the school system. Levels of school segregation relative to all other ethnic minorities tend to be highest among Bangladeshi (ID=0.74) and Pakistani students (ID=0.74). Black Caribbeans also have a high level of segregation (0.71). For Indians, the level of segregation at year 11 stands at 0.66 which is roughly the same score for Black Africans. For Chinese and White Others it stands at 0.59 and 0.45. Most groups have decreased their level of segregation relative to all other ethnic groups between 2008 and 2013. However, decreases are slight. So, if we look again at year 11 students, the greatest decline in the index of dissimilarity was observed for the White Others – a decline of 9 per cent. The weakest decline is evidenced among Pakistanis and Black Caribbeans both with a decline of 2 per cent. If we look at segregation of ethnic groups relative to the White British alone as opposed to all other ethnic groups, then the level of segregation is higher though also declining slightly. So at year 11 for Bangladeshis, relative to the White British, the index of dissimilarity stands at 0.81 while for Pakistanis it is 0.8, for Black Caribbeans it is 0.8, Black Africans 0.75, Chinese 0.61, Indians 0.73, and White Others 0.51. Across regions, there is variation in the level of segregation of ethnic minorities from the White British within schools. Again, only looking just at Year 11s, the highest level of school segregation is found in Yorkshire and The Humber and the lowest in the South West. The level in London is very close to the national average. Looking now at local authorities (district & unitary), the ten places where ethnic minorities are most segregated from the White British (as measured by the index of dissimilarity) within schools are: Blackburn with Darwen, Birmingham, Haringey, Bradford, Rochdale, Kirklees, Leicester, Oldham, Rotherham, and Manchester. The ten places where ethnic minority segregation is lowest are: Poole, Warrington, Central Bedfordshire, Bournemouth, York, Solihull, North Somerset, Bracknell Forest, Torbay, and Richmond upon Thames (note that all these have significant ethnic minority populations of pupils ranging from 6 to 35 per cent). Johnston et al found that schools were more segregated than the local neighbourhoods that they served, and that for South Asian, Black Caribbean and Black African pupils school segregation was more pronounced than segregation in the neighbourhoods they lived in. As Burgess wrote in a recent Demos publication, ‘schools do not dilute the residential segregation of the neighbourhood, but rather tend to strengthen it’. Ted Cantle has written that ‘a divided school invariably means a divided community’. He argues that ‘if schools are divided so too are parental networks, with little or no opportunities to break down barriers between communities’, pushing people towards ‘parallel lives’. Research carried out by academics at one school in Oldham gives us some interesting insights into what happens when school segregation is directly challenged though school mergers. The Waterhead Academy was formed when two highly segregated schools in Oldham were merged together in 2012. Researchers led by Miles Hewstone of the University of Oxford found that year on year the proportions of both white and Asian children expressing greater trust and liking of each other improved. Negative feelings decreased. However, Asian and white children tended to sit together at lunch time while friendship circles remained highly segregated – 2.5 per cent of the close friends of white students were Asian while 7.5 per cent of the friends of Asians were white. There has been a big increase in minority pupils in private schools in recent years. There has been a small increase in the number of faith schools in recent years only some of which are ethnically exclusive, and overall ethnic minorities are only slightly under-represented in faith schools. Black Caribbean children are disproportionately referred to Pupil Referral Units for pupils who have been excluded from school. About 88 per cent of teachers are White British. In 2014 there were 9.9 million schoolchildren altogether across the UK and 8.3 million school pupils in England (state and independent schools). Across the UK there were 4,116 secondary schools, 21,040 primary schools and 3,031 nursery schools. There were almost 3.5 million pupils in state-funded primary schools in England at the beginning of 2014, and around 30 per cent (1 million) of these were from ethnic minority backgrounds, including white minorities. There were roughly 95,000 Indian pupils, 151,000 Pakistani pupils, 60,000 Bangladeshi pupils, 13,000 Chinese students, 44,000 Black Caribbean pupils, and 128,000 Black African pupils. In addition, there were 185,000 mixed ethnicity pupils, 183,000 White Others, plus 60,000 pupils classified as ‘Other’. In the same year in state-funded secondary schools in England there were almost 3.2 million pupils, 25.3 per cent (nearly 800,000) of whom were from ethnic minority backgrounds – up from less than 20 per cent in 2009. There were 85,000 Indian pupils, 118,000 Pakistani pupils, 50,000 Bangladeshi pupils, 43,000 Black Caribbean pupils, and 100,000 Black African pupils. The proportion of White British pupils in state-funded primary schools in England fell from 74.7 per cent in 2009 to 69.8 per cent in 2014, and in secondary schools it fell from 78 per cent to 73.5 per cent over the same time. In contrast, the proportion of students from White Other backgrounds in state-funded primary schools rose from 3.9 per cent to 5.3 per cent in primary schools, and in secondary schools from 3.4 per cent to 4.1 per cent. This will be largely due to the significant growth in young Eastern European (especially Polish), Italian and Spanish populations in England. A faith school is a school that will follow the national curriculum, is associated with a particular religion, and is free to teach religious studies in accordance with its own religion. Anyone may apply but they may give preference to some children based on religious confession. Under the Equality Act (2010) faith schools are permitted to take religion into account when recruiting and appointing teaching staff. In 2012, there were 7,735 faith schools, both primary and secondary, in England of which 6,824 were state-maintained and 911 were independent. 4,865 of these were Church of England, 2,101 were Catholic, 92 were Jewish, and 153 were Muslim. Only 6 per cent of both Church of England and Catholic faith schools were independent compared to 53 per cent of Jewish and 91 per cent of Muslim schools. In England in 2014, 1.8 million children attended state-funded primary and secondary faith schools, that is 29 per cent of state primary school children and 18 per cent of secondary school pupils. There were just under 1 million children in Church of England faith schools, 700,000 in Catholic schools, 18,000 in Jewish schools and 7,000 in Muslim schools. These numbers do not include independent faith schools. In 2014, 24 per cent of pupils in faith schools in England were ethnic minority, slightly less than the average for non-faith schools. Such proportions in faith schools have not changed significantly since 2000. The number of state-funded faith schools has increased only slightly since January 2000 when 35 per cent of state-funded primary and 16 per cent of secondary schools in England were faith schools. The number of Christian schools has fallen slightly since 2007 while the number of non-Christian state-funded faith schools has increased, however the vast majority of faith schools are still Christian. Between January 2007 and September 2014, across both primary and secondary level, 11 Jewish and 11 Muslim state schools were created, while the number of Sikh schools also increased by 6. The first Muslim state school opened in 1998, the first Sikh one in 1999 and the first Hindu one in 2008. Religious identities often overlap with ethnic identities and therefore some faith schools effectively exclude other ethnic groups. But Christian faith schools are often ethnically mixed, with White British (and Irish) and Black Africans and Black Caribbeans well represented in the same school. For other religious groups ethnic mixing is much less. At secondary level, pupils attending state-funded faith schools tend to do better than those attending non-faith state schools but not by much. In 2013, 64 per cent of pupils in faith schools achieved 5 or more A*-C grades including English and Maths at GCSE compared to 60 per cent in non-faith schools. However, when we consider that pupils in faith schools are less likely to be eligible for free schools meals and more likely to have a strong academic record prior to secondary school these results are not surprising. Research by the British Humanist Association has found that some faith schools tend to be ethnically homogeneous. For instance, out of five Sikh state schools, four have no White British pupils. Similarly, out of 15 Muslim state schools, 8 have not White British pupils. On average, Muslim schools have 34 percentage points fewer White British pupils than would be expected for ethnically diverse schools. Asian pupils are under-represented in Catholic and Jewish schools but slightly over-represented in schools with no religious character. These are schools that are attended in addition to the main form of schooling in which the child participates. The majority of supplementary schools are targeted at specific ethnic minority groups and they operate in 53 languages. Supplementary schools run outside of usual school hours. In 2010 some supplementary schools focused on National Curriculum subjects but almost all (85 per cent) also focused on heritage and culture while 79 per cent taught mother tongue languages. In 2010, over 50 per cent of pupils attending supplementary schools were going for more than 3 hours a week. A 2010 report from the Department for Children, Schools, and Families found that 60 per cent of the schools they surveyed served one ethnic community. Nearly half of the supplementary schools served Asian communities, including pupils of Indian, Pakistani and Bangladeshi backgrounds, while 38 per cent served Black African communities, 23 per cent served Black Caribbean communities, and 22 per cent served European communities (from Poland, Greece and Russia among others). Simon Burgess and Ellen Greaves’ 2009 study asked whether ethnic minority pupils’ performance at school is affected by teachers’ expectations of them. They found that Black Caribbean and Black African pupils were under-marked when compared to their white counterparts, while Indian, Chinese pupils and those of mixed white and Asian ethnicity were over-marked. They concluded that teachers’ experience and received views of ethnic minorities outside school impacted on their marking practices. However, Tammy Campbell of the Institute for Education found that children from disadvantaged backgrounds can be viewed as less able due to unconscious biases held by teachers but that ethnicity was not tied to teachers’ assessments once other characteristics were taken into account. After controlling for economic situation, family structure and other factors, ethnic minority young people (aged 10-15) are less likely to be victims of bullying than white youths according to research by Tippet, Wolke, and Platt. They found Black African boys and girls experience the lowest rates of bullying. In 2007, the Department of Children, Schools and Families also found that pupils of mixed ethnicity (67 per cent) and white pupils (66 per cent) were most likely to have reported being bullied in the three preceding years. Levels were much lower for Bangladeshi and Indian pupils, these fell at 54 and 49 per cent respectively; there slightly higher than the figures estimated by NatCen in 2010.2 Between 58 and 61 per cent of Black African, Pakistani and Black Caribbean students reported bullying in the three preceding years. Across ethnic groups, boys are more likely to bully others than girls. However, Pakistani and Black Caribbean girls were significantly more likely to be perpetrators of bullying compared to white girls. Tippett et al have suggested that different parenting styles and parent-child relationships within ethnic groups may account for some variations in bullying involvement. Those of all ethnic groups for whom religion was important reported higher rates of bullying in the form of verbal abuse or name-calling. Detailed studies of intra-ethnic bullying suggest that within the broad ‘Asian’ category children are most likely to be bullied by pupils of a different Asian ethnicity or religious group.3 Metcalf and Rolfe have suggested that prejudices associated with particular cultures, such as Indian caste divides, have been imported to the UK along with migrant groups, potentially creating tensions at school. Anecdotal evidence suggests there may also be an issue with black children with lighter skin bullying their darker skinned peers. The provision of free school meals is much greater for most ethnic groups than for the White British of whom 12.5 per cent of GCSE students are in receipt compared to 22.8 per cent of ethnic minorities. The greatest proportions of school children on free school meals are to be found among the Bangladeshis – 38.5 per cent – and black Africans – 33.6 per cent. Indians and Chinese have substantially lower proportions of children on free school meals – 9.7 per cent and 7.4 per cent respectively. A report from the Department for Education found that Indian pupils were the least likely to truant – 8.1 per cent said they had truanted during Key Stage 3. The highest rates were found among mixed ethnic and Black Caribbean pupils – 21.6 per cent and 19 per cent respectively. 15.8 per cent of White British pupils had truanted during Key Stage 3. In 2012/13 pupils of Gypsy/Roma and Traveller of Irish Heritage saw the highest rate of permanent exclusion (expulsion) from school. Young people from Black Caribbean and mixed white and Black Caribbean backgrounds were approximately three times more likely to be expelled from school when compared to the national average. In 2009/10, Black Caribbean pupils were four times more likely to be permanently expelled from school than White British students, despite the number of expulsions having fallen by 40 per cent in the preceding six years. Indian, Pakistani and Bangladeshi pupils are all less likely than their White British counterparts to be expelled from school. Pupil Referral Units (PRUs), sometimes known as ‘short stay schools’, are for pupils who have been excluded from mainstream schools or are otherwise unable to attend any other school, including special schools. The most common reason for transfer to a PRU is behavioural problems. There are roughly 400 PRUs in England. According to Department for Education statistics in 2014 there were nearly 13,000 children in PRUs in England, 26 per cent of these being from ethnic minority backgrounds including white minorities, 70.9 per cent White British, the remainder being unclassified. Black Caribbean children are over-represented in Pupil Referral Units in England (3.9 per cent) when compared to their share of the overall state school population, as are mixed ethnic children whose parents are white and Black Caribbean. Overall the Asian category was least represented at 4.1 per cent of PRU pupils. Within this group the proportion of Pakistani children was four times that of Indian (2 per cent compared to 0.5 per cent) and twice that of Bangladeshis (1 per cent). While Pakistanis make up a substantially larger share of the state school population as a whole they are still slightly over-represented in PRUs. In 2013, 88 per cent of teachers were White British, down from 88.4 per cent in 2012. 93.9 per cent of head teachers were White British, down from 94.4 per cent. From year to year the ethnic mix of teachers changes very slowly. In 2010, only 6 per cent of head teachers, 7 per cent of deputy and assistant heads, and 11 per cent of classroom teachers in publicly funded schools were non-white compared to 24 per cent of pupils in those schools. Only unqualified teachers, 23 per cent of whom were non-white, were similarly represented when compared to the non-white student population (24 per cent). Among other ethnic groups, those best represented among teachers in 2013 were White Other (3.5 per cent), White Irish (1.7 per cent), Indian (1.6 per cent) and Black Caribbean (1 per cent). The proportion of teachers from other ethnic groups is very small. The under-representation of ethnic minorities in the school workforce extends to teaching assistants (87.1 per cent White British) and non-teaching staff such as cleaners and cafeteria staff (87.6 per cent White British). A significantly higher proportion of visible minority Britons now go to university compared with the white majority. This is true of both the prestigious Russell Group universities and the post-1992 new universities. But white students are more likely to get first class degrees, less likely to drop out and to be unemployed shortly after graduation. Ethnic minority students tend to be found in post-1992 universities in London and in other cities too but not to the same extent. Ethnic minority students account for over 60 per cent of full-time undergraduates in the new universities in London compared to 36 per cent in London’s pre-1992 universities. And recently, London Metropolitan University accepted 6,115 black students compared to 7,815 accepted by the entirety of the Russell Group. The Chinese are much more likely to remain in education after completion of Key Stage 5 – 84 per cent. They also have the highest rate of students going on to study at HEIs along with the highest rates of access to the top third of HEIs and the Russell Group – 30 per cent of Chinese students went on from Key Stage 5 to Russell Group universities. Indian students also have higher rates of continuing into further education especially in comparison to the White British. 80 per cent remained in education after completing Key Stage 5 while 68 per cent went on to study at a HEI. 26 per cent made it into the top third of HEIs while 16 per cent got into Russell Group universities. Pakistanis and Bangladeshis now have higher rates of students going into higher education than the White British – the rates are in line with those of Indians. They are less likely to get into the top tier of universities than Indians but their chances are now roughly in line with the White British – 8 per cent of Pakistanis made it into Russell Group universities as did 10 per cent of Bangladeshi students. A similar pattern is found for Black Africans while Black Caribbeans have somewhat higher rates of continuing in education and going to university than the White British but their access to the elite institutions is the lowest – 4 per cent of Black Caribbean Key Stage 5 leavers went to Russell Group universities. It is not just a question of ethnicity but rather ethnicity and social class, as research by Claire Crawford and Ellen Greaves for the Institute for Fiscal Studies demonstrates. Overall, they found that children from each of the major ethnic minority groups within England were more likely to go to university than their White British counterparts. For each ethnic group, there are strong class based differentials – more children from the highest socio-economic group will go to university than those from the lowest. What is most striking is how this class difference varies between ethnic groups. For instance, 12.8 per cent of the poorest White British children went to university compared to 53.8 per cent of the richest – a gap of 42 percentage points. By contrast, 65.5 per cent of the poorest Chinese children went to university compared to 81.5 per cent of the richest – a gap of 16 percentage points. The gap between rich and poor university access is the greatest for the White British. Poor white British children are the least likely to go to university both within and across ethnic groups. But when we look at the richest then they are roughly as likely to go to university as the richest Black Caribbean children but still less likely to go than the richest children from other ethnic groups, most notably Indian and Chinese. 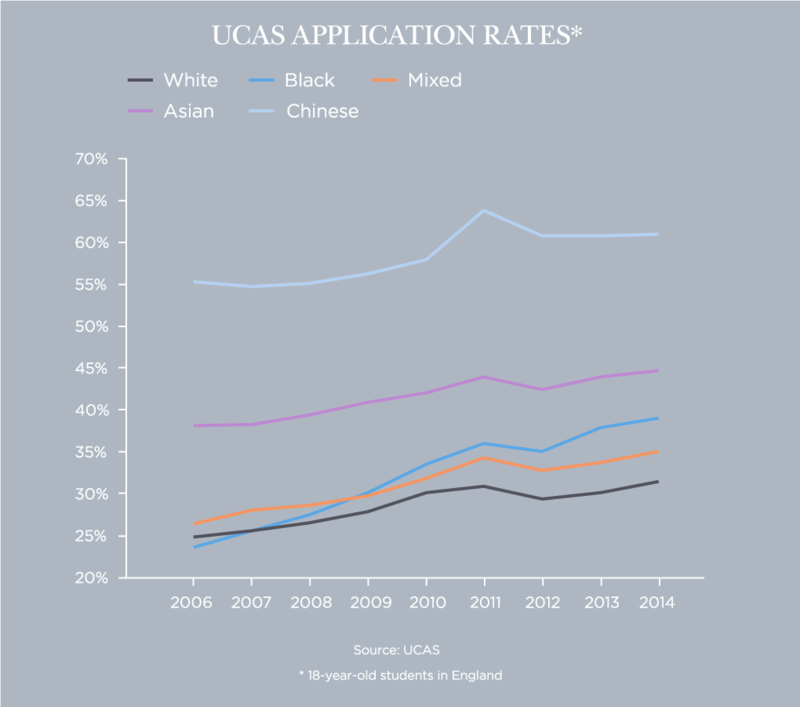 The Chinese have an application rate (defined as the proportion of 18 year olds applying through UCAS to higher education in cases where ethnicity is known) that dwarfs that of all other ethnic groups. In 2014, 60.9 per cent of Chinese students (aged 18) made a UCAS application in England compared to an average of 33.2 per cent. The lowest application rate was found among white people at 31.4 per cent. For Asians it stood at 44.7 per cent and black people 39 per cent. UCAS does ask about ethnicity on applications but this information is only given to universities once decisions have been taken. The names of applicants are known by admissions tutors along with some other personal details and this could in theory lead to discrimination. 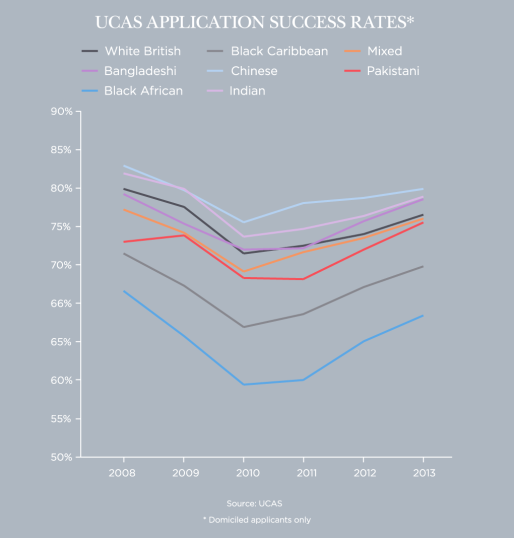 One possible reason why black people have lower chances of success in UCAS applications is that they have been more likely to apply on the basis of access qualifications rather than A-levels. These are qualifications designed to bring people into higher education who lack traditional qualifications – if they are competing against people with A-levels then they may lose out. In 2000, 17 per cent of Black Caribbeans and 14 per cent of Black Africans in England were accepted on the basis of access qualifications compared with 3 per cent of white successful applicants and 2 per cent of Chinese. Furthermore, Black Caribbean and Black African successful applicants have tended to have lower A-level scores as have Bangladeshis and Pakistanis while scores for Chinese, White British, and Indians have been higher. Research by Vikki Boliver shows that ethnic differences in offer rates are greatly reduced once controlling for A-level attainment. Oxford and Cambridge have been criticised for lack of ethnic minority students (all the data here refers to Oxford). Ethnic minority students are less likely to apply to Oxford than white students: in 2012, 21 per cent of the best white students (AAA+) applied compared to 18 per cent of the best ethnic minority students. In 2014, there were 8,634 applications to Oxford at undergraduate level from UK domiciled white students of which 25 per cent were successful (note these figures refer to cases only where ethnicity is disclosed). There were 2,131 applications from non-white students with only 16 per cent being successful. Applications from mixed-ethnic students were the most likely to be successful. There were 224 applications to Oxford from Chinese students and 16 per cent were successful. Indian applications numbered 471 with 16.4 per cent being successful. Applications from Pakistanis are much more numerous than Bangladeshis – 153 compared to 76 – but have similar success rates: 8 per cent and 11 per cent respectively. There were 207 applications from Black Africans of whom 10 per cent were successful while only 31 came from Black Caribbeans with 13 per cent successful – that is 4 acceptances. The absolute numbers of non-white applicants to Oxford have increased: in 2006/8 there were 4,706 compared to 6,197 in 2012/14 although the rate of change has declined more recently. Non-white applicants have also increased in proportional terms: in 2006/8 16.1 per cent of applicants were non-white compared to 18.9 per cent in 2012/14. Success rates have been falling for non-whites from 21 per cent in 2006/8 to 16 per cent in 2012/14 but they have also fallen for whites too – from 29 per cent to 26 per cent. In 2011, offer rates at Oxford were higher for white applicants (24 per cent) than for Black Caribbeans (18.9 per cent), Pakistanis (4.9 per cent), and Bangladeshis (9.9 per cent). Part of the overall difference in success rates for applications at Oxford can be explained by the fact that ethnic minority students tend to apply to more over-subscribed courses. However, if we look at applications for specific subjects then there are strong differences – so in 2010/11 white applicants to medicine were twice as likely to get a place as minority ethnic candidates. Similar differences were found for economics and management but puzzlingly none for law. At Cambridge, the proportion of undergraduates who were non-white was 23.2 per cent in 2013/14. For postgraduates, it was 33 per cent. Furthermore, the proportions of students getting 1st class degrees was roughly equal between white and non-white students. However, non-white students were slightly more likely to get a 2.2 or worse – 35.7 per cent compared to 31.4 per cent for whites. In 2012, offer rates at Cambridge were also higher for white applicants (30.8 per cent) than for Black Caribbeans (18.9 per cent), Pakistanis (15.7 per cent), and Bangladeshis (16.9 per cent). A freedom of information request made by the Guardian newspaper showed that applicants with three A*s at A-level applying to study medicine at Cambridge were 20 per cent more likely to be made an offer if they were white. For white applicants with top grades, 56 per cent received an offer compared to 46 per cent of non-white applicants. Such analysis does not however take into account performance in pre-entry examinations and interviews and so discrimination ought not to be immediately inferred. In 2013/14 there were 1.5 million UK domiciled undergraduates. 80 percent of those of known ethnicity were white while 20.6 per cent were non-white ethnic minorities. The ethnic minority group with the largest share was the Black Africans at 4.6 per cent while that with the smallest was the Chinese at 0.8 per cent. Among undergraduates, the gender balance is in favour of women – there are 870,000 female students compared to 660,000 males. Across ethnic groups however, there is variation; for instance the gender gap is greatest for Black Caribbeans at 33 percentage points in favour of women while for white people it stands at 14 percentage points and for Black Africans it is 15 percentage points. For South Asian students as well as the Chinese the gender gap is much smaller: for example for Indians it is 6 percentage points while for Chinese it is 3 percentage points. At postgraduate level there were 335,000 students taking courses in 2013/14. Of those of known ethnicity, 81 per cent were white. The largest shares of non-white minority students were Black Africans and Indians – both 4 per cent. Again, there are more females than males: 198,000 compared to 137,000. Once more it is Black Caribbeans who have the greatest gender gap only this time it is even greater at 47 per cent. For white people, there is also a strong gender gap in favour of women at 21 percentage points. In the case of Indians, Bangladeshis, and Pakistanis, the gender gap is both small relative to other groups and also relative to undergraduates. Indeed for Pakistanis it stands at 0 percentage points while for Bangladeshis it is -2 percentage points in favour of men. Ethnicity seems to have some bearing on what is studied at university. Science subjects are studied by a greater proportion of Indians and Chinese students than other ethnic groups. 55.1 per cent of Indians were studying science and 54.4 per cent of Chinese. The lowest proportions studying science were found among Black Caribbeans and Bangladeshis – 38.8 per cent and 41.9 per cent respectively. Within the sciences, medicine and dentistry are highly competitive and seen as both highly respected and well-paid professions. Indians and Chinese students are much better represented in studying these subjects: 8.9 per cent of Indians and 7 per cent of Chinese. The proportion of Pakistanis was relatively high at 5.3 per cent while for all other groups it was much lower. The lowest proportion studying either medicine or dentistry was found among Black Caribbeans at just 0.7 per cent. All the major non-white ethnic minority groups study computer science more than white people with Bangladeshis leading the way at 7.6 per cent. Social studies is more favoured by Black Caribbeans (14.1 per cent), Black Africans (14.2 per cent), and Bangladeshis (12.3 per cent) while law is more popular with Pakistanis (9.4 per cent) and Bangladeshis (8 per cent). Business and administrative studies is favoured by Pakistanis and Bangladeshis – 18.1 per cent and 19 per cent of students respectively, although Chinese, Black Africans, and Indians are not too far behind. Rates are low among white people and Black Caribbeans – 9.6 per cent and 13.7 per cent respectively. 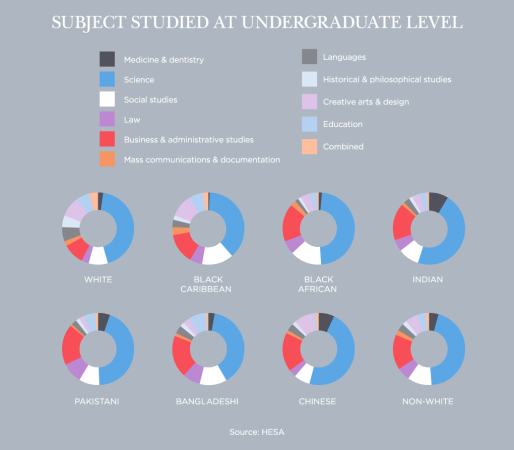 Studying for the creative arts and design are favoured by whites (9.3 per cent), Black Caribbeans (10.4 per cent), and Chinese students (8.5 per cent) – all the other major ethnic groups have much lower participation levels. Education studies are more popular among Bangladeshis (8 per cent), Black Caribbeans (6.4 per cent), and white students (6 per cent) than other ethnic groups. White students are more likely to get first class degrees than non-white ethnic minority students at undergraduate level as of 2012/13 – 20.4 per cent compared to 12.2 per cent. Those ethnic minority groups with the highest proportions getting first class degrees were the Indians and Chinese at 15.8 and 16.5 per cent respectively. The lowest proportions are found among Black Caribbeans and Black Africans – 7.4 and 7.6 per cent respectively. For Pakistanis and Bangladeshis the proportions getting firsts are 10.1 per cent and 10.8 per cent respectively. Similarly, white students are less likely than non-white ethnic minority students to get third class degrees – 4.3 per cent compared to 9.2 per cent. Relatively high proportions of thirds were received by Black Caribbean and Black African undergraduates while low proportions were found among Indians and Chinese although still they were greater than the proportion of whites. The proportions of students achieving either a first or an upper second class degree has been rising steadily. However, some ethnic groups are seeing slightly higher rates of change than others. Chinese students have seen the sharpest improvements since 2003/4 while sharp improvements for Asian and Black students have been evidenced since 2008/9 that surpass those of whites. In 2010 the Equality Challenge Unit found that there was an attainment gap between white and non-white ethnic minorities at university. Research showed that this deficit could not be explained by the characteristics of the students themselves. The Runnymede Trust found that non-white minority students still achieve lower class degrees than white students even when they enter university with identical or similar pre-entry qualifications such as A-level grades and even when they are from similar socio-economic backgrounds and their parents have similar levels of education. Research by Broecke and Nicolls found that differences in academic attainment at university persisted once controlling for among other things gender, prior attainment, coming from a deprived background, subject of study, and the type of institute attended. The attainment gap was greatest for Black Caribbeans, Black Africans, and Chinese students. The attainment gap between white and non-white ethnic minority varies by subject. The gap in terms of the proportion getting first class degrees is greatest in engineering and technology at 13.8 percentage points. It is least in historical and philosophical subjects at 5.9 percentage points. White undergraduate students are somewhat less likely to drop out of higher education after their first year. 6.4 per cent of white students in 2011/12 did not continue onto the second year of their courses compared to 7.9 per cent of non-white ethnic minorities. Drop-out rates were highest among Black Caribbeans at 10.8 per cent and Black Africans at 9.1 per cent. For Asian students, the rates are lower with 5 per cent of Indians, 7.7 per cent of Pakistani, and 8.3 per cent of Bangladeshi students dropping out prior to the second year. For Chinese students, drop-out was low, also at 5 per cent. A report by the National Union of Students (NUS) found there was the perception among black students that many were beginning their studies with lower academic skills and cultural understanding than white students. 67 per cent said they felt able to bring their own unique perspectives as black people to bear on their lectures and seminars. The majority felt they had adequate support from their tutors although around one quarter felt unsupported. Only 7 per cent described their teaching and learning environment as racist while 54 per cent described it as respectful. However, 16 per cent reported experiencing racism. This research is based on internet surveys and focus groups both of which will have strong selection-related biases. In 2012/13, 73.4 per cent of university staff were white (in cases where ethnicity is known). The best represented visible ethnic groups were Indians and Chinese with 2 and 1.6 per cent respectively. 1 per cent of academic staff were Black African while 0.7 per cent are Black Caribbean. 0.6 per cent were Pakistani and 0.2 per cent Bangladeshi. Looking only at academic staff (namely those working in research or teaching), it is clear that more white academics are professors than non-white. 10.2 per cent of white academics are professors compared to 6.4 per cent of non-white academics. However, if we look only at British nationals then the gap is much less pronounced. 10.7 per cent of white UK national academics are professors compared to 9.5 per cent of non-white. For Chinese UK nationals, 13.5 per cent are professors as are 9.9 per cent of Indian UK nationals and 4.1 per cent of Black UK nationals. Generally, academics who are UK nationals are more likely to be professors than foreign nationals. Six months after graduation, non-white ethnic minority graduates are almost twice as likely to be unemployed as white graduates. In 2012/13, 10.8 per cent of non-white graduates were unemployed compared to 5.2 per cent of white graduates. White graduates were more likely to go onto full-time work than non-whites: 59.1 per cent compared to 51 per cent. Non-white graduates are slightly more likely to continue studying full-time: 12.6 per cent compared to 10.6 per cent of whites. The highest rates of unemployment soon after graduation are found among Black Africans with 13.2 per cent being unemployed. This compares to 12.8 per cent of Pakistani, 12.5 per cent of Chinese, 11.9 per cent of Bangladeshis, 9.4 per cent of Indians, and 9.1 per cent of Black Caribbeans. 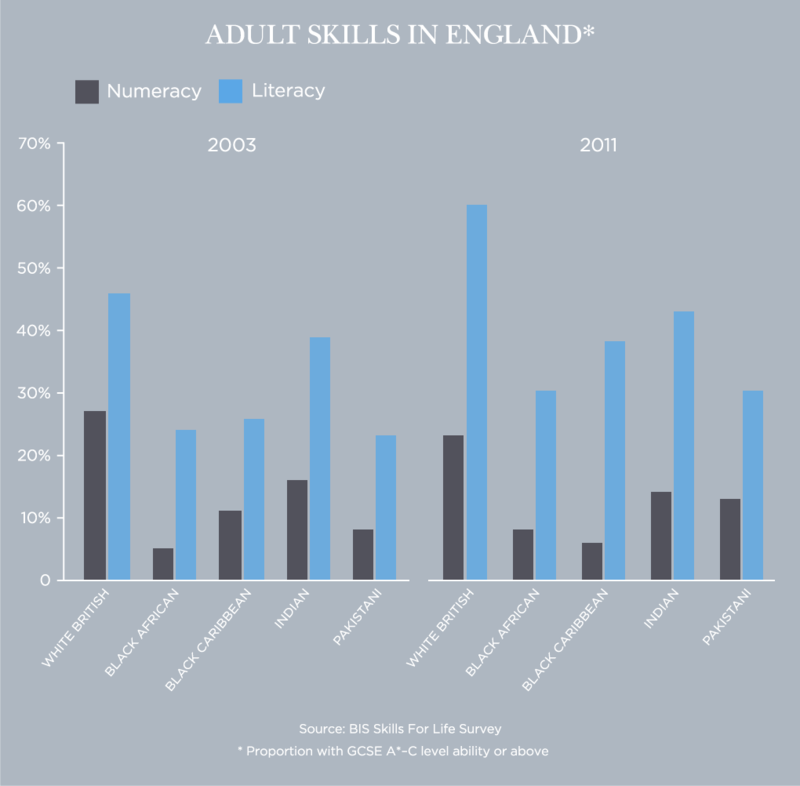 When it comes to basic skills – numeracy and literacy – ethnic minorities continue to lag the White British majority, reflecting the historic lower levels of education of first and second generation immigrants. Each ethnic group has a distinct pattern of educational attainment. For the White British in 2011, 25.7 per cent had obtained a degree level or above qualification or above while 23.9 per cent had no qualifications. 4.1 per cent had obtained apprenticeships as their highest level of education. For ethnic minorities, 34.2 per cent had degree level qualifications or above, 17 per cent had no qualifications, and 1.1 per cent apprenticeships. As is well known, there has been an enormous expansion of higher education and access to it has improved steadily since 1991 for all ethnic groups. 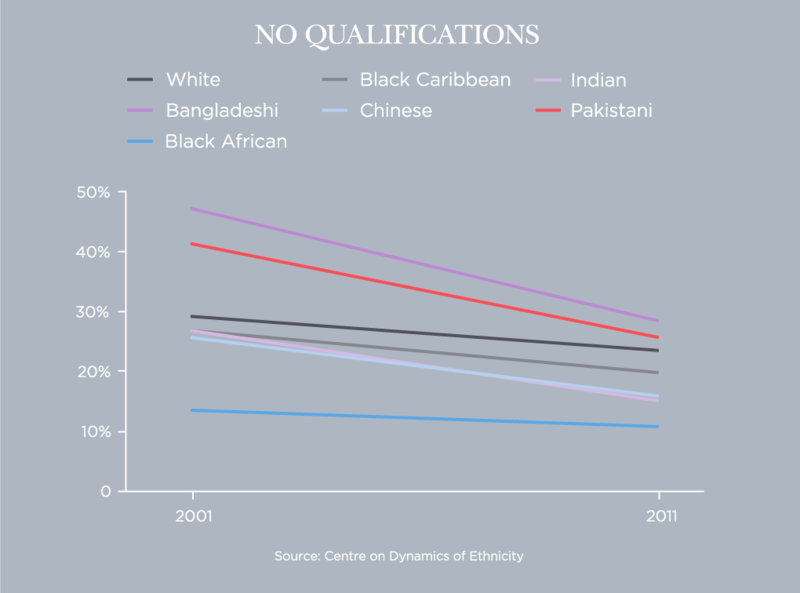 However, the proportion of Black Africans with degree level qualifications has not risen between 2001 and 2011 (presumably linked to the immigration of less well educated people). Indians have had the sharpest increase in the proportion of degree level qualifications while the Chinese have very high proportions. Bangladeshis and Pakistanis have lower rates although there is not too much to distinguish the latter from white people. Gender gaps have in the main narrowed or gone into reverse. Pakistani and Bangladeshi women have achieved dramatic improvements in educational achievement over the past two decades. However, they still lag behind the other major ethnic groups. Between 2001 and 2011, there has also been a sharp decline in the proportions of people who had no qualifications. The decline has been most telling for Bangladeshis: in 2001 47 per cent were without qualifications while in 2011 it was 28 per cent. Pakistanis have also had a similar improvement. Declines in the proportion of those without qualifications have been the lowest for Black Africans. Immigrants now tend to be better qualified than the UK born. According to the 2011 census of England & Wales, 35 per cent of immigrants had degree level qualifications or above compared with 26 per cent of those born here. Furthermore, a report by the OECD found that of the top-performing quarter of school pupils, one third were from immigrant families. First generation immigrants have tended to be not as qualified as second generation immigrants. For instance, in the 2010s the proportion of first generation Black Caribbeans with no qualifications was 39 per cent compared to 16 per cent for the second generation. 33 per cent of Black African first generation immigrants had no qualifications compared to 8 per cent of the second generation. For Indians, 34 per cent of first generation immigrants had no qualifications compared to 10 per cent of the second generation. For Pakistanis and Bangladeshis, the share of first generation immigrants with no qualifications is higher at 55 per cent while for second generation immigrants it is 20 per cent. If we look at the shares of second generation immigrants with no qualifications going back to the 1970s then there is a nearly uniform trend of decline from decade to decade with the exception being for Pakistanis and Bangladeshis. 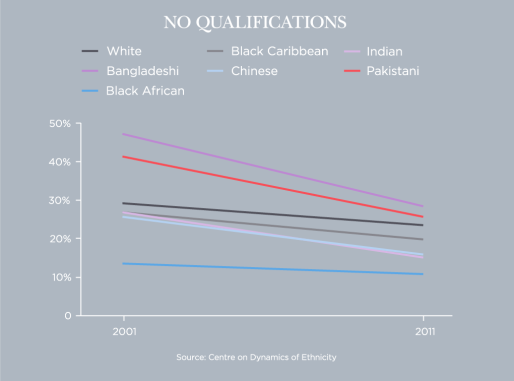 For this group, the proportion with no qualifications increased in the 1980s to 57 per cent before declining in line with other ethnic groups to a low of 20 per cent. Non-whites tend are more likely to be overqualified for the jobs they do than whites. 40.8 per cent of Black African graduates, 31.7 per cent of Indian, 35.8 per cent of Pakistani, 39 per cent of Bangladeshi, and 36.3 per cent of Chinese graduates were working in professions that did not require a degree. This compares to 24.6 per cent of white graduates. Data from the Skills for Life Survey allow us to look at basic numeracy, literacy, and computer skills among adults by ethnicity. Starting with numeracy, in 2011 23 per cent of the White British were performing at GCSE A*-C level or above while 5 per cent had the numeracy skills of a 5-7 year old. A further 30 per cent had numeracy skills at GCSE D-G level while 26 per cent had the skill level of a 9 to 11 year old. Indians and Pakistanis had lower proportions with GCSE A*-C level or above – 14 per cent and 13 per cent respectively – while the proportions performing at the level of a 5-7 year old stood at 13 per cent and 17 per cent respectively. 31 per cent of Indians had the skills of a 9 to 11 year old as did 24 per cent of Pakistanis. Black Caribbeans had small numbers at the top and bottom of the spectrum with the largest body— 74 per cent — having the numerical skills of a 7 to 11 year old. 6 per cent of Black Caribbeans had numerical skills at GCSE A*-C level. For Black Africans, 20 per cent had the numerical skills of a 5-7 year old while only 8 per cent were at GCSE A*-C level or above. In fact for Black Africans, roughly 70 per cent had numerical skills lower than GCSE level. Levels of numeracy have declined between 2003 and 2011 for the White British, Indians, and Black Caribbeans. This is not true however for Pakistanis and Black Africans for whom it has risen. In fact the improvement has been most dramatic for Pakistanis for whom in 2003, 31 per cent had the most basic levels of numeracy compared to 17 per cent in 2011. Turning now to literacy skills, in 2011 60 per cent of White British had GCSE A*-C level or above literacy skills while only 3 per cent had the most basic skills. A further 29 per cent had literacy levels at GCSE D-G level. It is hard to say who is performing better when comparing Black Caribbeans and Indians: overall 82 per cent of Black Caribbeans were performing at GCSE D-G or above compared to 69 per cent of Indians. However, there is a greater proportion of Indians performing at GCSE A*-C level or above than Black Caribbeans; simultaneously for Indians the proportion with only the most rudimentary skills is 10 per cent while for Black Caribbeans it is zero. This will be largely reflective of recent immigration. 30 per cent of Black Africans had GCSE A*-C level literacy skills while 27 per cent were at GCSE D-G level; 43 per cent were at a level lower than GCSE level. A similar picture emerges for Pakistanis with 30 per cent at GCSE A*-C level and 29 per cent at GCSE D-G level; 43 per cent were at a pre-GCSE level. Improvements in literacy have been apparent between 2003 and 2011. The greatest improvements were among the White British and Black Caribbeans while for Indians, Black Caribbeans, and Black Africans experienced more modest improvements. Notably, non-white ethnic minority adults read books less frequently with 68 per cent reporting reading every day compared to 79 per cent of white people. They also write (in English and by hand) somewhat less – 60 per cent compared to 65 per cent. Non-white ethnic minority adults report slightly higher self-appraisals of their computer skills compared to white people – 37 per cent reported their skills were ‘very good’ compared to 32 per cent. This is probably a function of whites being older. Non-white ethnic minorities and white people have roughly equal access to computers although white people are more likely to have access at work – 51 per cent compared to 46 per cent. Non-white ethnic minority adults reported sending more emails than white people – 56 per cent compared to 45 per cent.